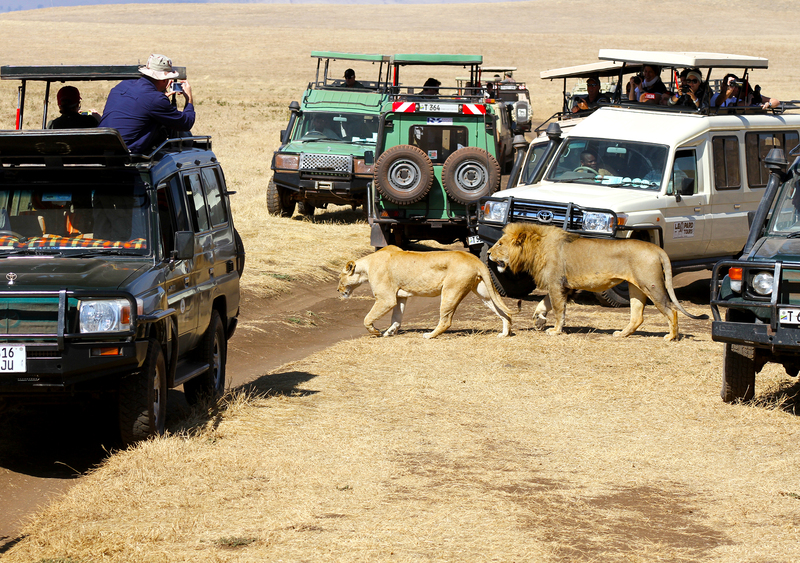 Each day, safari jeeps make the climb up along the rim and descend down into the Ngorongoro Crater to observe this unique collection of Mother Nature's wonders. 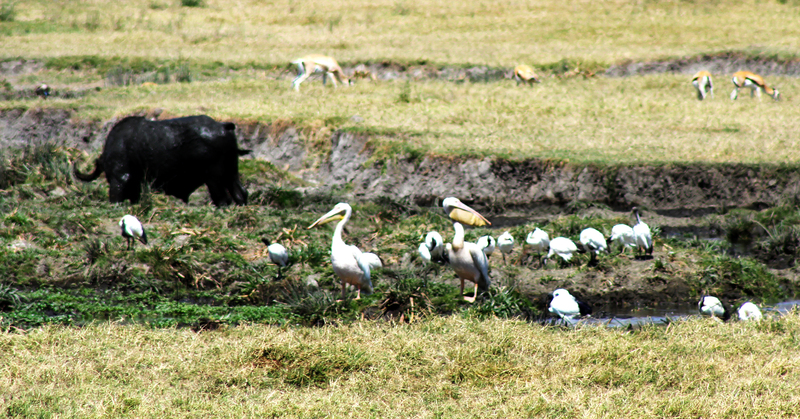 This is what we found on just one day's safari from The Manor at Ngorongoro. In my first article on Safari Surprises, I showed you ten images from 48 hours in Serengeti National Park -- animal behaviors you could never predict you'd actually see before setting out on a full day of safari. Here we go again! The Ngorongoro Crater in Tanzania, located between the Kilimanjaro highlands and the plains of the Serengeti, is a very special type of safari destination. Ngorongoro is the world's largest (100 square miles) completely intact, inactive, and unfilled volcanic caldera. Three million years ago what would have been one of the highest volcanoes in Africa exploded and collapsed inwards on itself forming an enormous earthen bowl 2,000 feet deep. Today that bowl is a UNESCO Heritage Site and the home of 100's of Africa's rare species. 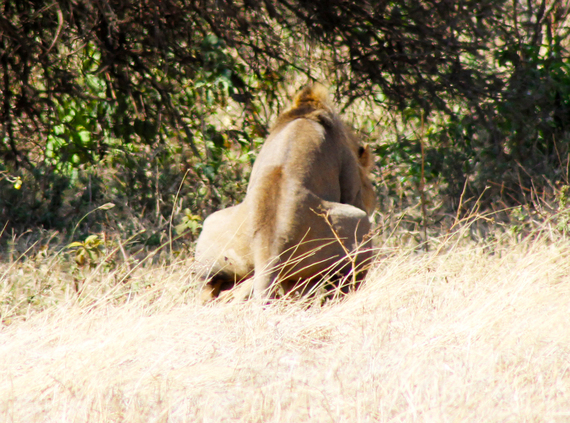 The Ngorongoro lions live a somewhat luxurious existence when it comes to their prey. The crater acts like an enormous holding pen containing tens of thousands of munchy edibles (wildebeest, zebra, eland, gazelles, buffalo, warthogs, etc.). Because of this permanent feast the crater boasts one of the highest concentrations of lions found anywhere in Africa. As far as the jeeps go, the lions could care less about them; seeing them each and every day without incident makes the jeeps a non-entity in the minds of the lions, something to simply walk around like a rock. Lions making love is a brief affair, blink and you could easily miss it. This tender moment lasted no more than 10 seconds, and these love birds were off into the bushes. Lionesses aren't bound by African weather cycles when they reproduce, and therefore observations of lions mating can take place any time of the year. If you believe you're observing a pair in the throws of courtship you may not have to wait long to witness the deed being done. While mating a lioness copulates as many as 40 times a day. Vultures get a bad rap! We don't often think of them as tender, caring parents; rather associating them with death and decay. 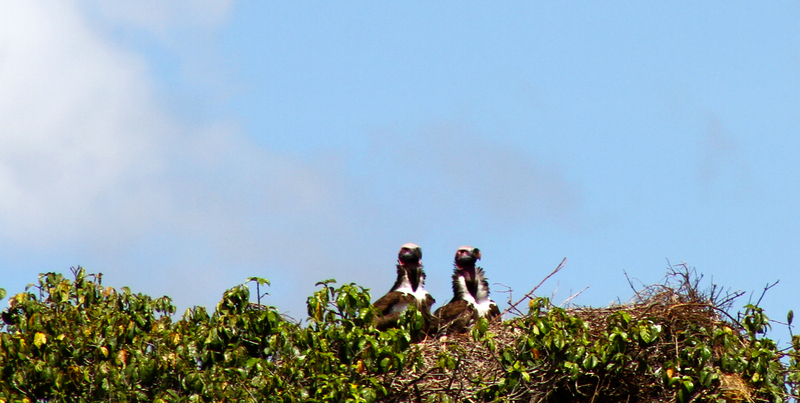 These lappet-faced vultures have their little one tucked under the front portion of their feathers, having either just come from, or preparing to head out to gather fresh meat. The lappet-faced is the king the vulture world, being Africa's largest and most powerful it is the first on the scene at any fresh carcass, and can pick and choose the meat it desires. No other vulture would dare challenge it. 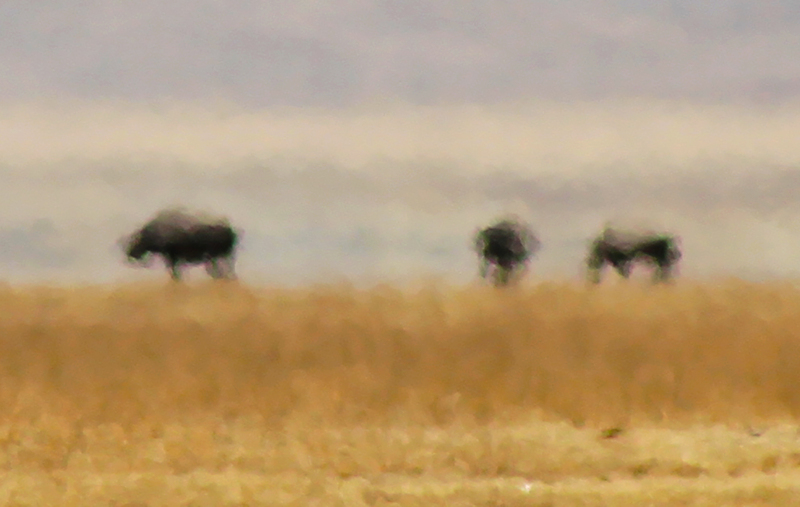 This image may look like a Monet savannah-scape watercolor, but in fact it's a 15x zoom image of 4 black rhinos on the plains of Ngorongoro (one of those blobs is actually two of them). Our guide told us that currently only 17 black rhinos were believed to be living inside the crater itself representing a sizable fraction of the black rhinos living within the nation of Tanzania ( ~100 in a country over twice the size of California). Seeing a black rhino in the wild in Tanzania is an exceedingly rare event, and seeing them up close almost never occurs. It has been the policy of Tanzanian wildlife management as of late to attempt to scare the black rhinos away from the roads frequented by tourist vehicles. The Central African warthog is not as much a fighter as he is a fleer. 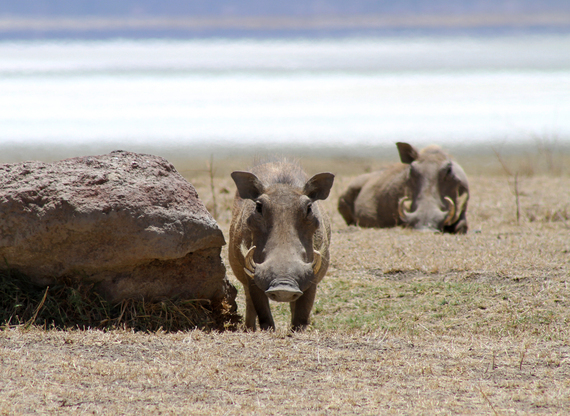 When it comes to danger the warthog is a runner, and for sightings on safari it all comes down to how habituated a particular animal is to seeing jeeps (mothers with piglets almost always run as soon as the jeep comes into range, and the sight of running piglet warthogs is hilarious). These two posed for the camera and in doing so exposed an old war wound. The warthog in the background lost his ear either fighting other males for mating rights or from a predator in a near death escape. Superlatives in the bird world are a matter of debate. Is the world's largest flying bird the one that is the heaviest (kori bustard) or the one with the longest wingspan (albatross). Pelicans would like you to recognize that you can be both heavy and big-winged. These great white pelicans are among the world's largest flying birds in both dimensions, massive when seen standing next to these sacred ibis (themselves large African birds). But even in the pelican world there is competition: Asia's dalmatian pelican fancies itself the world's largest pelican, on average ever so slightly larger than the great white pelican. Jackals are not picky about their meals, often relegated to the leftovers of the carnivores that far outrank them on the crater's plains (lions, leopards, cheetahs, hyenas). Jackals are so opportunistic about food that they'll even eat overripe fruit leftover by primates. 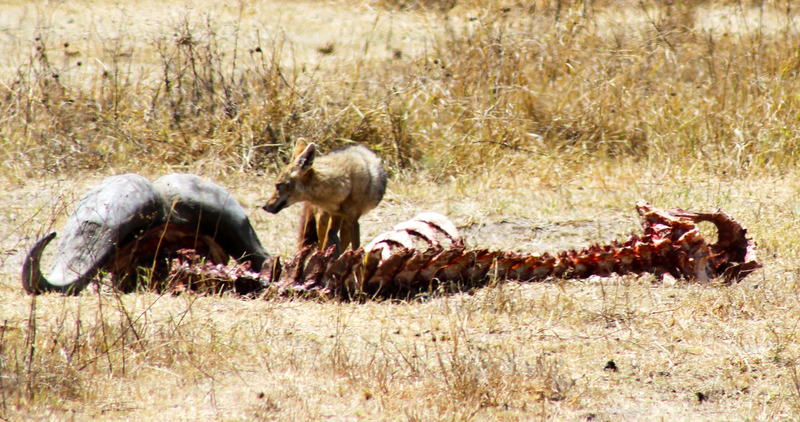 This side-stripped jackal spent some time looking over this picked over buffalo carcass before settling on the face and brains (what was left of them) for afternoon lunch. Hippopotamuses are not usually sun bathers. 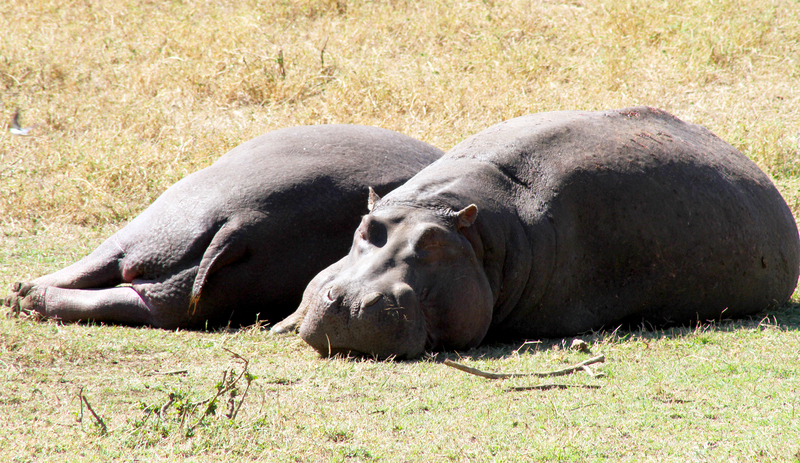 You don't often see them out of the water working on their tans; to hippos tanning is death. The sun so aggressively bothers the hippos that they almost exclusively feed at night under the cover of darkness when they can safely leave the waters that protect them to roam for green grasses. What are these two doing out of the water? Our guide told us it happens on occasion. No one knows what's truly on the mind of a hippopotamus. When we chose to enjoy our lunch at one of the Ngorongoro picnic sites we knew it would place us out in elements surrounded by wildlife. This is actually quite common, and not as dangerous as one might think. Each guide is trained to keep a watchful eye on the wild animals that may wander near the picnic site (we had a few buffalo, many vervet monkeys, and a few zebras make an appearance). 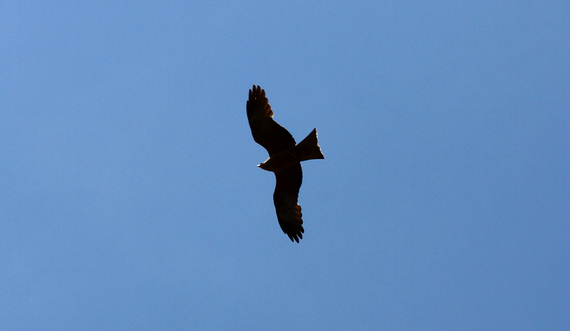 One animal the guides in Ngorongoro are specifically watchful for is the black kite (pictured above). This kite spent the entire lunch perched never more than 100 feet away waiting for me to make a false move with my grilled chicken. In fact, when I made a joke of the entire situation and shook a chicken leg above my head, the kite immediately flew down to take advantage of my stupidity. It scared the bejesus out of us! 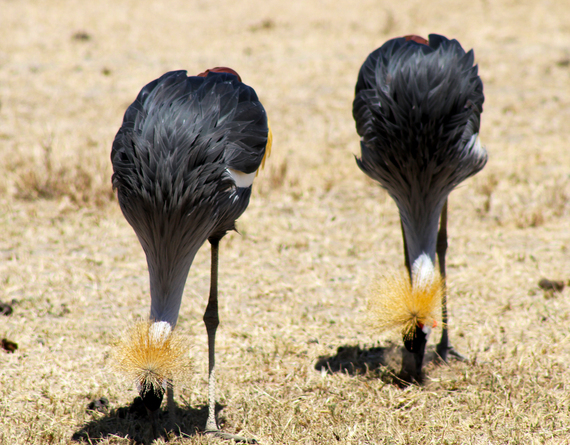 The crested crane is one of Ngorongoro's most pleasant sights. I had seen crested cranes in the wild before (always in pairs because they are the picture of monogamy), but never to the extent I saw them in the crater. A pair of birds became 4, became 8 and then 16, and soon there were over 100; so many that we couldn't capture them all in one photograph. Each and every time I've gone on safari I've seen something new, something I've never had the pleasure of seeing before. On this drive into the Ngorongoro I was amazed at my first glimpse of lions mating, touched by the sight of vultures with their young, shocked at the aggressive nature of black kites, and was in total awe of a field full of crested cranes flooding the view in every direction.